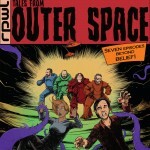 Share the post "Album review: RPWL – Tales From Outer Space"
You know what it’s like. You go to a gig and there’s a couple of support bands and you’re thinking to yourself “these are quite good” – then the main band comes on and blows them into next week. Thus it is with German progressive rock behemoths RPWL, who, since their formation in 1997 and their first album ‘God Has Failed’, have occupied a throne at prog’s top table – showing countless wannabes just how it should be done. ‘Tales From Outer Space’ is their seventh studio album, an output enhanced by many superb live recordings (check the GRTR! archive) and whilst they have never released a bad album, here they have surely exceeded even their own high expectations. For this is a beast of an album. Unlike their most recent output, ‘Tales From Outer Space’ is a concept album only insofar as the tracks are linked by the theme of outer space – the perception of it from Earth and how Earth could be perceived from an alien visitation. As usual, from one of the most philosophically articulate bands out there, the lyrical content is both imaginative and thought-provoking which, when linked to music of real depth and conviction played by musicians at the top of their game, proves to be an intoxicating mix. ‘A New World’ lays down the marker, the (inevitable) spacey opening seguéing into a superb driving riff and a great chorus – delivering eight minutes of the finest rock music you’re likely to hear this year. The centrepiece of the album is the superb ‘Light Of The World’ – ten minutes of progressive rock Nirvana with stunning guitar work from Kalle Wallner, who, with similarities to Riverside’s Mariusz Duda’s side project Lunatic Soul, has really upped his game following his excellent ‘Blind Ego’ solo work. Anthemic riffs abound and with great vocals from Yogi Lang the track flows effortlessly between passages – intensely heavy to light as a feather and you can never see the join. The joys continue on the early ‘Floyd-like ‘Not Our Place To Be’ where Guy Pratt (Dave Gilmour, Pink Floyd) pops up on bass and where Earth is viewed by aliens observing “people living off the goodwill of a greedy few who pull the strings; engines on, this is not our place to be”. An Edge-like U2 riff drives ‘What I Really Need’ – a disparaging critique of naked capitalism, and ‘Give Birth To The Sun’ gives everyone a chance to take it all in before fabulous drumming (a feature throughout) by Marc Turiaux builds the track to a swirling vortex with Wallner’s guitar again to the fore. Closer ‘Far Away From Home’ with its pastoral piano motif gives Lang another opportunity to show what a fine singer he is – and we’re done. It is only every so often an album as fine as this comes around – and in the mind-numbing vacuum of bugger-all that passes for much of music these days, the opportunity to absorb its brilliance should not, and must not, be missed. This entry was posted in ALBUM REVIEWS, ALBUM REVIEWS (Mobile), All Posts and tagged album, Blind Ego, Guy Pratt, Kalle Wallner, Pink Floyd, Progressive Rock, review, RPWL, Tales From Outer Space, Yogi Lang. Bookmark the permalink.